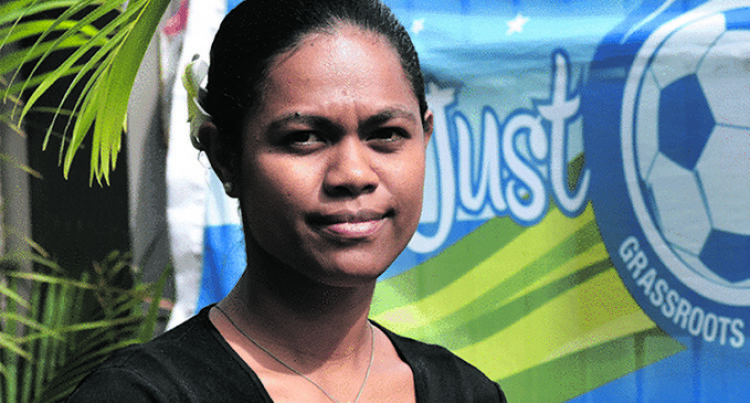 This is the story of Matelita Vua­koso who is also dubbed as a com­munity role model. Vuakoso hails from Vunidamoli in Wailevu, Caka­udrove and has represented the country in Olympic and World Cup football qualifiers at junior and sen­ior levels. From being the goalkeeper of the national women’s football side to become a leading ath­lete champion in the Oceania Na­tional Olympic Committees STOP programme and Voices of the Ath­letes Educator. She is also a senior instructor on the Just Play programme of the Oceania Football Confederation. SUN: What’s your current position? SUN: How long have you been in this position? SUN: Can you give me a brief over­view of what it is you do in your work? MATELITA; I provide support for the development and growth of the VOA programme through positive collaboration with the national fed­erations and FASANOC Commis­sions. And with the intentions that ath­letes perform key roles in the Olym­pic movement within Fiji. SUN: What motivates you to do what you do? SUN: What are you most passionate about? MATELITA: Working along with other athletes from various nation­al federations. SUN: What are the goals you most want to accomplish in your work? Not so much the goals that are in your job description, but the goals you hold personally? MATELITA: Work goals- Continue to engage and build athletes lead­ers (champions) to be involved in the FASANOC VOA programme. And to give back to the community in Fiji and extend the reach of the programme. On personal goals- continue to strive for excellence in everything I do in life. SUN: What were you doing previ­ously? MATELITA: I was employed by Fiji Football Association as a Just Play senior instructor mainly facilitat­ing courses in Fiji and regionally. SUN: Now if we can, I’d like to go way back for a little while. Where did you grow up? MATELITA: I grew up in the vil­lage of Laucala in Savusavu, Caka­udrove. SUN: Countries that you have been to doing work and what was it like? MATELITA: I have been to several countries, Tonga, Federated State of Micronesia, Japan and Vanuatu. It was great experience with a lot of learning and most of all taking back what I have learnt to share with my colleagues and its applica­tion to make it work. SUN: Did you have any key mentors or people who deeply influenced who you are, what you believe in and what you’re committed to do in your work and life? MATELITA: I do have a lot of peo­ple that inspires me through their stories and achievements. I believe that everything in life is possible if you have a vision and work towards it. SUN: Did you have any life-chang­ing experiences and challenges that put you on the path that led you to be doing what you’re doing today? Tell me about them? MATELITA: Mostly life changing experiences like the transition from being an athlete (goalkeeper) and to be a volunteer for the Just Play Programme and also be part of FASANOC Voices of the Athlete programme. This contributed a lot to my personal development as an athlete and it leads up to where I am today. SUN: As an active woman involved in sports, how do you see or analyse the role of women in sports specifi­cally in Fiji and how important is it to encourage more women taking up roles in various sporting federations. I can see more women are now in­volved in sports in Fiji. Sports are a tool that can contrib­ute a lot in life and I hope to see more women to take up executive roles in various sports federations. SUN: When you think of the future of the kind of work you’ve talked about here, what gives you a sense of hope? MATELITA: More athletes to be in­volved or employed for the various sporting federations and to be part of FASANOC. SUN: What’s next for you in your work? What are you looking forward to? MATELITA: Looking forward to more and greater opportunities.